Renal/Urinary System Description | Your Guide to Healthy Living! The Renal / Urinary System is vital for healthy living since it filters extra and toxic liquid from the bloodstream and get rid of them. You will poison your body if it doesn’t happen resulting in: swelling (excess liquid), tiredness / weakness (anemia), bone disorders, increased cardiovascular risks and kidney failure. Given these facts, you need to do all possible to safeguard against nutrient deficiency in your Urinary System. The Renal System description below helps you to understand the importance of the system and how the system works. This aids in making more informed bladder health, kidney health and urinary health supplement choices. Especially, when your diet alone falls short in the supplying the nutrients your Urinary System needs to function optimally. Integumentary System Processes that excretes waste products through the skin by sweating. The Urinary System works closely together with the Circulatory System, Endocrine System, Musculoskeletal System and Nervous System. The role, main functions and organs of the human Renal / Urinary System are outlined below. The Renal / Urinary System filters wastes and extra fluid from the bloodstream and removes them from the body. It maintains suitable fluid levels by regulating the amount of water that is excreted in the urine. Urine is formed within the kidneys by filtering blood. Electrolyte Balance Regulation: The Renal System regulates the ionic (electric charges) composition of plasma, the liquid portion of blood. The kidney excretes the proper number of electrolytes (ions), such as calcium, sodium, magnesium, potassium, chloride, phosphates and bicarbonate. These electrolytes are important for muscle and nerve working. Acid-Based Homeostasis (balance): The kidneys of the Urinary System are necessary for acid-base homeostasis, that is maintaining proper PH in the blood (acid-base balance). To accomplish this the kidneys excrete hydrogen ( H+) ions and reabsorbs bicarbonate ions into the blood plasma, as needed. Blood Volume Regulation: The kidneys of Renal System also regulate the blood plasma volume. The higher your plasma volume, the higher your blood pressure. In other words, your kidneys indirectly maintain your blood pressure by regulating the amount of water you excrete in the form of urine. Hormone Secretion: The kidneys of the Urinary system also assist the Endocrine System in releasing hormones. The Urinary System, also known as the renal system, consists of the two kidneys, two ureters, urinary bladder and urethra. The kidneys are two bean-shaped organs that filter the blood to remove wastes and produce urine. The commonly referred to Urinary Tract includes the ureters, urinary bladder and urethra. The Urinary Tract drains the urine from the kidneys and after storing it, releases the urine. 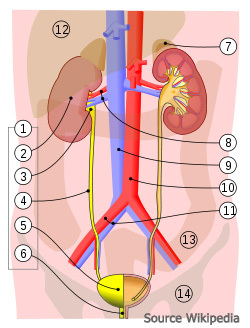 Referring to the Urine System diagram, the diagram illustrates the main parts of the system (numbers 1-6), and associated organs (numbers 7 to 14), as follows: Human Urinary System (1), Kidney (2), Renal Pelvis (3), Ureter (4), Urinary Bladder (5), Urethra (6), Adrenal Gland (7), Renal Artery and Vein (8), Inferior Vena Cava (9), Abdominal Aorta (10), Common Iliac Artery and Vein (11), Liver (12), Large Intestine (13) and Pelvis(14). The best supplements for your Renal / Urinary System are based on user reviews and will be continually updated. Please provide comments and submit your recommendations on supplements that work for bladder health, kidney health and urinary health by completing the form below.